The air is crisp, and twinkle lights are out all around the city lighting up the dark nights. True winter means you’re wearing a scarf ALL THE TIME! So, why not rock an indigo-dyed infinity scarf! Perfect for keeping the chill off. All I Want For Christmas Is…..Deep Into Indigo! Are you wishing that Santa helps you get your Christmas wish of a hot summer weekend of indigo dyeing in 2018, but want to know a little more first? Q: Can I bring my own fabric to dye? YES! 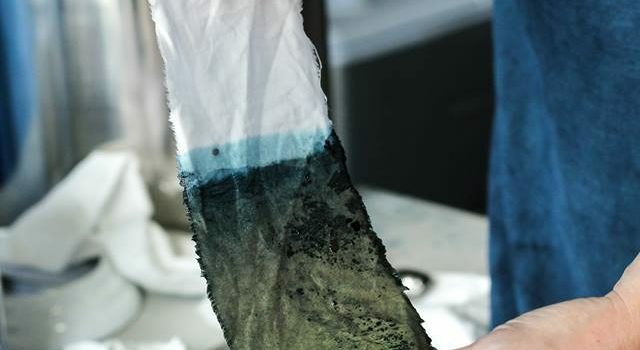 While the retreat price includes all your materials, including fabric, tools, and access to prepared dye vats, you can bring whatever you want (as long as it’s natural fiber) to prep and dye during the retreat. Q: Will I learn how to prepare different types of indigo vats? YES! Jen will demonstrate how to do both natural and synthetic vats. Q: What is included in the cost of the retreat? Deep Into Indigo is an all-inclusive retreat. That means you get your lodging, meals (including wine and cocktails), instruction and all indigo dyeing supplies & tools. You can bring your own fabric, but only if you want to.